Fair Trade USA, the leading third-party certifier of Fair Trade products in North America, earlier this month announced that it has certified one billion pounds of Fair Trade coffee since its founding in 1998. This historic milestone, made possible by the sustainable sourcing practices of nearly 500 coffee companies, helped Fair Trade coffee farmers and farm workers earn almost $124 million in Community Development Premiums to date, with $30.8 million in 2013 alone. In celebration of this historic impact, Fair Trade USA is proud to unveil several new initiatives to help secure the future of sustainable coffee for generations to come. In the first half of 2013, Fair Trade farmers earned an average of $0.84-$0.89 per pound above the New York market price. This was a result of quality differentials, Fair Trade prices and premiums, and more direct negotiations with buyers, for example. Fair Trade USA launched an Emergency Rust Response Fund, awarding $50,000 in grants to two Peruvian cooperatives—CAC Oro Verde and CAC Satipo—to invest in rust prevention and mitigation based on their compelling proposals. 67 new coffee companies became partners of Fair Trade USA, including: The Coffee Bean & Tea Leaf, Topeca Coffee, Coda Coffee Company (Roast Magazine’s Macro Roaster of the Year, 2014), Gimme! Coffee (Macro Roaster of the Year, 2013), and Dillanos Coffee Roasters (Macro Roaster of the Year, 2011). The increasingly popular Fair Trade Month campaign was supported by over 60 brands garnering over 700 million impressions and generating retail activity across North America. Consumer awareness of the Fair Trade Certified™ label increased to 55% of the U.S. population, according to a recent study from NMI (Natural Marketing Institute). A similar study found that the Fair Trade Certified label is the most recognized Fair Trade label in Canada. Improving Supply Chain Visibility: Fair Trade USA has acquired Acopio, Inc., an innovative, technology-based tool that allows cooperatives to capture, analyze, and manage transaction data. The platform is also expected to enable the exchange of impact data between farmers and buyers. Minimizing Risk: In partnership with producers and importers, Fair Trade USA has launched price risk management programs in Nicaragua, Peru, and Costa Rica. The goal is to develop best practices in risk management, and to begin exploring new simulation technologies that help co-ops better understand the market and manage risk effectively. Certification Collaboration: Fair Trade USA has heard from people across the industry the need to better align with other programs, particularly in areas like standards, audits, and impact definition. In 2014 and beyond, we’re committed to collaborating with others to increase impact and efficiency for all. Creating Solutions for Food Service: The organization has launched a new program called “By-The-Cup,” which is tailored to meet the unique needs of the food service industry. When asked what is next on the horizon…Dolan confirmed that based on the successful launch of the Coffee and Tea Festival Philly in 2013, the show will be returning to the Philadelphia area this fall (November 8-9). “We are also working on the 2015 New York City show which will be the 10th anniversary of the festival,” said Dolan who is busy brainstorming some new ideas with her staff and colleagues. “Cup for Education would like to thank all the generous exhibitors from the NY Coffee & Tea Festival who donated a prize to make our fundraising raffle a great success this past March. All the tickets were drawn the following week and prizes sent out. We were pleased to receive such gracious feedback from many of our winners. We’d like to extend a special thank you to Tea’s Tea / ITO EN for their extra donation of a percentage of their sales at the Festival. For more information about Cup For Education visit www.cupforeducation.org or follow them on Facebook. A blend created in honor of all mothers. Here’s a great gift for Mom, or the perfect choice if you are hosting a Mother’s Day Tea. This is a beautiful, refreshing caffeine-free cup; chamomile flowers blended with rosebuds, cornflowers, and orange peel, infused with citrus flavor. A beautiful blend of rosebuds, chamomile, cornflowers, and orange peel. A pale orange-yellow, almost peach. A definite floral aroma mixed with the smell of chamomile. Subtle flavors of rose and citrus combine with mellow chamomile. White Castle, long known for serving The Original Slider®, is also popular for its great tasting medium roast coffee that is now available in single-serve coffee cups. It’s a perfect cup of coffee every time, whether brewing at home or in the office. Since 1996, White Castle has sold its bagged Original Restaurant Blend Coffee in grocery stores to provide Cravers the opportunity to enjoy a delicious cup of White Castle coffee in the comfort of their own home. Fast -forward to today, the popularity of single serve brewing systems has exploded. A 2012 study from the National Coffee Association shows significant growth in the single-serve format and a forecast for continued growth. Currently, single-serve cups account for more than a quarter of every dollar spent on coffee in the United States. Experts forecast that by 2018, the amount Americans spend on single serve coffee pods will equal what is being spent on bulk coffee. To match the growing consumer demand, White Castle now offers its Original Restaurant Blend Coffee in single-serve cups sold in packs of 12 for $9.99. Coffee Cravers can purchase their favorite java in single-serve cups at more than 400 White Castle restaurants, online at the House of Crave, as well as at local grocery stores. Shoppers are encouraged to look and ask for the coffee by name. The single-serve cups are also compatible with brewers that accept K-Cup® portion cups. White Castle’s coffee is made by selecting only the highest grade 100% Arabica beans to maximize flavor and aroma. Cravers with a discriminating taste will find that White Castle’s Original Restaurant Blend is a great cup of coffee. Coffee was one of the four original menu items when it was first served at founder Billy Ingram’s flagship restaurant in Wichita, Kansas in 1921. In addition, the menu included The Original Slider® , pie and Coca-Cola. Now you can brew White Castle coffee in the comfort of your own castle. Please join Andrew Freedman Home artist-in-residence Michele Brody for a Spring Time Tea in her Copper Tea House for Reflections in Tea. Take a surprise trip to The Bronx on Saturdays in May and June where tea lovers of all ages are welcome to share a story or special memory. Shared memories will then become part of Michele's Tea House installation as well as a future community art book. This FREE event takes place May 3, 10, 24, 31 and June 7, 14, 28 from 1:30 to 3:00 pm (or by appointment) at the Andrew Freedman Home in The Bronx (1125 Grand Concourse, Bronx, NY 10452 -- in the balcony niche on the first floor). The tea for this exhibit is sponsored by SerendipiTea. UP Coffee, the first product from Jawbone Labs, is the simplest way to u nderstand how caffeine affects your sleep. Behind its delightful interface, Jawbone's world-class data scientists crunch numbers so you can learn about your body’s reaction to caffeine effortlessly – without becoming jittery or disrupting your sleep. Pair with UP by Jawbone to find out if afternoon pick-me-ups keep you awake at night, by how much, and what you can do to sleep more soundly. Don’t have an UP band? No problem. UP Coffee is for all. See how your caffeine levels change throughout the day as you down espressos, energy drinks and even chocolate. UP Coffee knows when you’re WIRED and how long it will take you to become SLEEP READY. The Republic of Tea, leading purveyor of premium teas, recently debuted their new collection of Biodynamic® Teas and a brand new Get Clean Stackable tin. At the recent Natural Products Expo in Anaheim California, they also showcased many other new tea collections including: Hicaf™ Teas, One Cuppa™ Teas and Iced Tea, Downton Abbey® Teas and Cuppa Cake™ Teas. The new line of 100% Biodynamic teas includes Biodynamic Organic Heirloom Chamomile and Biodynamic Organic Darjeeling. To receive Biodynamic certification, farms must meet the following standards: agronomic guidelines, greenhouse management, structural components, livestock guidelines, and post harvest handling and processing procedures. The Biodynamic Heirloom Chamomile Tea is grown on a small, 100-acre certified Biodynamic® garden at the base of the Italian Alps, and is harvested at night when the essential oils are at their peak. Biodynamic Organic Darjeeling comes from a multi-generational tea garden in northern India. Feeling out of sorts? The Republic of Tea is launching a two-week's worth of cleansing teas in one tin trio, including two new flavors and the popular get clean, from its collection of Be Well Red® teas. The tin features an AM Tea, to wake up and get clean, get clean, an All Day Tea, to get clean anytime, and a PM Tea, to get clean at the end of the day. These herbal teas can be used alone or in conjunction with a cleansing program to help the body get back into balance. All three tins snap together for ease of storage or pull apart for portability. They are perfect as a gift or a trial size. The Republic of Tea is the first company to introduce a complete line of high-caffeine natural energy teas. The HiCAF Tea Collection is all-natural and Certified Gluten-Free and has almost twice the caffeine than a cup of coffee, which allows for a better buzz. The five teas in the line include Breakfast Black Tea, Caramel Black Tea, Pom-Berry Black Tea, Coconut Black Tea, and Gingermint Green Tea. This new line of environmentally friendly single-serve One Cuppa™ teas, Premium Tea without the Teapot, are compatible with most popular single serve brewing machines. One Cuppa teas are filled with only the finest quality tea, handpicked from the most prized tea gardens around the world and offer a convenient way to enjoy an authentic tea experience at home or in the office. One Cuppa teas are available in six unique and delicious flavors that are all Certified Gluten-Free: Hibiscus Watermelon Iced Tea, Ginger Peach Black Tea, British Breakfast Black Tea, Decaf Ginger Peach Black Tea, Pomegranate Green Tea and Natural Hibiscus Herb Tea. Inspired by the award-winning TV series that has entranced millions of viewers and become a global phenomenon, The Republic of Tea Downton Abbey® teas are all-natural, calorie-free and gluten-free. This collection is comprised of three delicious flavors: English Rose Tea, Grantham Breakfast Blend and Downton Estate Blend (exclusive to Cost Plus World Market). Inspired by delectable cake recipes, the rich aromas of baked goods fresh from the oven and other decadent, natural flavors of Cuppa Cake™ Teas are sure to satisfy any sweet tooth. This delightful, new collection is comprised of three scrumptious dessert tea flavors: Blueberry Bundt Tea, Caramel Vanilla Tea, and Lemon Chiffon Tea. Each of these teas are calorie-free and gluten-free. The Republic of Tea is available nationwide at natural and specialty food stores, cafes and through the company website (http://www.REPUBLICofTEA.com), mail-order catalogue and by calling, 800.298.4832. In celebration of Earth Day, specialty coffee retailer, Bird Rock Coffee Roasters, announced its participation in the first ever “Clear and Green” campaign, aimed at providing transparency about where products originate and how they are produced. The campaign, hosted by ProductBio, is working with local businesses in La Jolla to help educate them on eco-friendly practices and green initiatives. In addition to ongoing sustainability practices, Bird Rock Coffee Roasters earlier this month launched its new biodegradable coffee bag. The bags were engineered to biodegrade once they come in contact with microbes found in soil and water, including those found in backyard composts and landfills. And important to Bird Rock’s location, the bags will degrade in both salt and fresh water. Bird Rock Coffee Roasters is the only coffee vendor in San Diego utilizing these bags, and they expect to distribute more than 20,000 this year. Bird Rock Coffee Roasters partnership with ProductBio further amplifies its influence on a local level as it continues to demonstrate global influence and leadership in direct trade practices, a step beyond fair trade especially in regards to increased economic benefit to farmers. 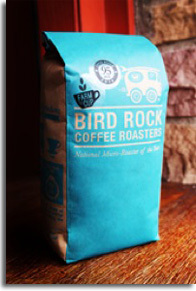 Bird Rock Coffee Roasters focuses its sustainability efforts in several areas, including: cultivation, roasting, packaging, usage, and disposal. Bird Rock Coffee Roasters cultivation practices are comprised of direct trade sourcing with farmers from all over the world, and investing in those farms to help develop and cultivate sustainable farming practices. The coffee beans are roasted using only energy efficient roasters and afterburners. Coffee packaging is sustainable, biodegradable, and recyclable. Bird Rock Coffee Roasters’ cafe maintains efficient water usage, provides only sustainable paper products, supports its local community and sponsors global non-profits in the coffee growing communities. Ensures all disposable products, from cups to waste, are recycled appropriately. “Bird Rock Coffee Roasters has a responsibility to set a strong example to our neighboring business community about conducting sustainable practices,” said Chuck Patton, owner of Bird Rock Coffee Roasters. “We care about our community and want our customers to know where their coffee is coming from. We’re proud to work with ProductBio to share our experience to help encourage other businesses in the area to do the same.” For more information, please visit www.birdrockcoffee.com.